I often hear people saying Charlotte is trying to be like this city or trying to be like that city. And their remarks are usually in a negative tone. I always talk about how this is a great city to live in (if you don't like it, move) and it has a lot to offer. National media often recognizes, and such was the case with the front-page story in today's St. Petersburg Times. The Times lauds Charlotte's light rail system and talks about how it is a model Tampa Bay should follow. Voters in the Florida city are facing a referendum in this November's election to decide if they want a tax hike to help pay for a rail line that would stretch from Tampa International Airport to downtown, the University of South Florida and Cross Creek Boulevard near New Tampa. The newspaper sent a couple of journalists to Charlotte. 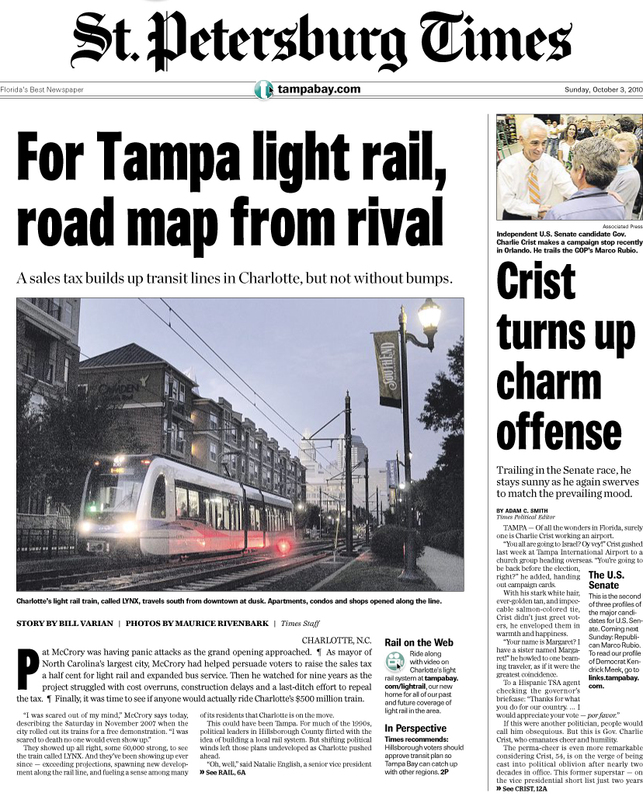 The article in today's paper, "In Charlotte, Tampa sees its vision for light rail," shows how many Charlotteans had doubts about building the LYNX Blue Line when the issue was being debated years ago, but that since opening in November 2007 the light rail has been largely deemed successful. The article touts how the light rail has exceeded ridership projections and the line has spurred development. In an accompanying article, "In downtown Charlotte, a car-free option awaits travelers," the writer chronicles how when he visited Charlotte he tested to see if he could get around the city efficiently on our transit system. He rode the Sprinter bus from the airport and, over four days, rode the buses, Gold Rush, and light rail. During his trip, he says he spent a total of $17 on transportation--"less than what it cost me to check a bag on the plane each way," he points out. Below is an accompanying video the Times journalists captured while riding Charlotte's light rail.